In July, 1841, Emerson wrote to Carlyle: "My whole philosophy...teaches acquiescence and optimism." The journals in this volume, beginning in the summer of 1841, record the spiritual history of two years that can be viewed as the most critical test in Emerson's life of his ability to maintain the two aspects of that philosophy. Early in 1842 his son Waldo died, and the man who only months before had described himself as "professor of the joyous Science" found himself once again confronting the full implications of grief. Seeking to comprehend the loss, he used his journals to articulate and rediscover the vital faith upon which his philosophy rested. In passages that went eventually into "Experience," and in the earliest drafts of the poem "Threnody," which appear for the first time in these pages, he discovered that even this harsh event had its "compensations." Waldo's death forced a reassessment of the convictions that gave life to his earlier writings. He transformed his numb responses into his most moving poetry and prose, giving new and significant meaning to his "old motto": "I am Defeated all the time, yet to Victory I am born." 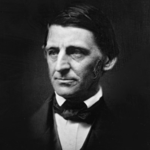 Emerson's motto is revealing, for its concepts display aptly the bipolarity that characterizes so much of his thought during these crucial years. He carried on at length an internal debate between the active and passive life styles. He saw his friends committed in their various ways to a more emphatic practice of their philosophies than he was able to undertake. Moving between engagement and withdrawal, commitment and aloofness, action and passivity, he consistently sought that point of equilibrium where the opposing forces of his thought could be held in creative tension. As Emerson's private experience deepened, he was becoming more completely the public man of letters: writing, publishing, editing The Dial, and lecturing. His travels brought him in contact with the leading men of his day, and with sights and exposures which even his beloved New England could not offer. Amidst the public duties, however, it was Concord which remained the still, vital center of his life. A brilliant and widely diversified range of visitors brought the world to Emerson's home and inspired him to explore personal and literary issues which he would develop in his journals and later utilize in lectures and essays. 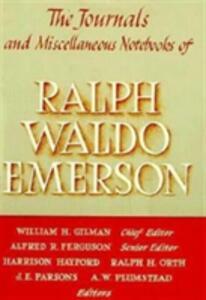 Emerson saw his calling as that of a poet; these journals are abundant in verse. Working versions of some of his most noted poems reveal the complex relationship between his private and literary life and the manner in which he attempted to fuse the diversities of his thought. In the eight regular journals and three miscellaneous notebooks of this volume is the record of these fusions. This period of his life closes, as it opened, with "acquiescence and optimism." But the creative skepticism which is so characteristic of the second series of essays and the poems of 1841-1843 is the mark of a "very real philosophy," tempered and tried by adversity, by success, and by "Experience."